This past Thursday we celebrated our annual footwashing ceremony honoring our immigrant community at the steps of San Francisco City Hall. In these ceremonies, our purpose is to honor the God given dignity of migrants with an ancient foot washing ritual. In our current toxic anti-immigrant rhetoric, many migrants have been demonized by demagogues who try to blame every particular evil on immigrants. We want to take a stand against this rhetoric and offer this healing ritual to our immigrant community. We also took a stand against the narrative of “family vs. felons” that tries to divide families, and instead offer a narrative of grace and restoration. This narrative has been used to justify the deportations of many hard working immigrants who had committed mistakes in the past but have changed their life around. This unforgiving narrative leaves no space for changed lives. We believe that every human being is capable of transformation, and that those who committed a crime and have already paid for it should not be doubly punished by deportation. Eddy Zheng, an immigrant from China, was one of many who offered their testimonies. He recounted how as a teenager he committed a felony and was incarcerated. While in prison and through education he was able to change his life. When he finally got out of prison, he resolved to help young people not to commit the same mistake he did many years ago. Unfortunately, ICE placed a hold on him after spending 19 years in prison, transferred him to ICE detention for several years, trying to deport him. ICE still considered him a menace to our society, and under their narrative of deporting “felons not families”, Eddy was put through deportation proceedings. Eddy is a perfect example of why we stand against ICE’s divisive narrative. We believe this narrative leaves no space for transformation. This narrative will affect countless people who have paid for their mistake and are now contributors to our society. Click here to learn more about a recent documentary on Eddy Zheng, Breathing. 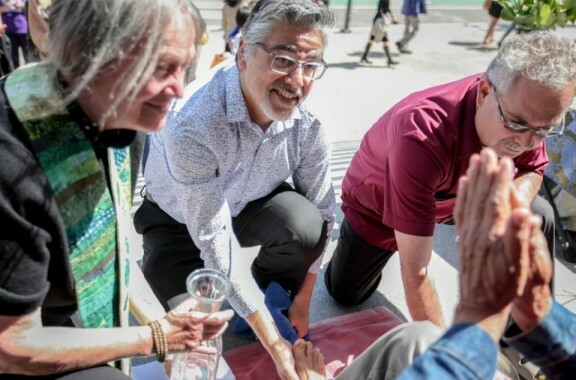 Supervisor Avalos was present in the ceremony, and participated by washing migrant’s feet. He recently introduced a new legislation that will update San Francisco’s Sanctuary laws by limiting collaboration between local law enforcement and ICE. The Right Rev. Bishop Marc from the Episcopal Diocese of California was also one of the participants, along with other clergy from many faith traditions. In the end, many migrants expressed their gratitude to us, saying how significant and moving this space was for them. Photo Essay by S.F. Examiner.